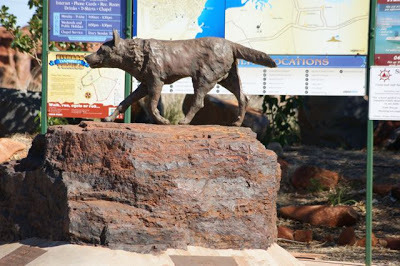 At the entrance to the Australian mining town of Dampier, a bronze statue stands tall in honour of the legendary Red Dog who acquired a cult status in the region (quite like Greyfriar’s Bobby in Scotland) for bringing the community together when such a notion hadn’t existed in the mine town. Red Dog Statue (The Pilbara Wanderer) – at Dampier, Australia celebrates the life and times of the most famous Australian dog. In the late 1990s, one tourist to the town happened to be Louis de Bernières (English author of Captain Corelli’s Mandolin) who adapted the story of Red Dog into a famous children’s book and the inspiration behind the movie Red Dog. The world is a funny place, no? Sometimes you pick your dog. Sometimes your dog picks you. Imagine a dog so independent and yet overtly sentimental with a strong sense of rights to stop a car and get a lift; to hitchhike through the great continent in search of his dead master. Red Dog supposedly was also given a bank account by the Bank of New South Wales, which is said to have used him as a mascot and sales tool with the slogan “If Red banks at the Wales, then you can too”. ‘You need to have a home to be homesick, mate!’ A still from Red Dog starring Josh Lucas, Rachael Taylor and Koko, the dog. The movie Red Dog (2011) rolls out in set pieces like chapters of the book, each episode celebrating the life and times of the Red Dog. The plot showcases miners reminiscing their tales about the stray that changed their lives for good. From the lonely Italian worker Vanno to the suicidal Jocko, all were changed for better by Red Dog. But it’s the Red Dog’s relationship with John (American Josh Lucas) and Nancy (Rachael Taylor) that steals the scenes without effort. We are all running away from a story we left behind. It’s always worth to find someone worth staying for. Red Dog, the movie has the structure and schema resembling the template of a great family film and yet nothing seems pre-ordained. Backed by great performance by the ensemble cast and a stellar cinematography, the odyssey lends the movie a deep connect with the great Australian wilderness.